Last week I taught a “baking with ancient grains” cooking class. With 2 hours to wow and inspire my students, and a tiny oven, I had to come up with recipes that could be prepared and baked together. On the menu was emmer coffee cake, onion galette with einka crust, and grilled flatbread, three ways. Our first flatbread was made with 100% Bluebird einka flour, next was 100% Bluebird emmer flour and last was a 50/50 Bluebird emmer and Bluebird hard white flour blend. I wanted my students to experience the unique flavors and performance of our whole grain ancient einka flour (a variety of Einkorn wheat) and whole grain emmer flour. Flatbread was a perfect fit. All three doughs were unique in flavor, character, and performance. 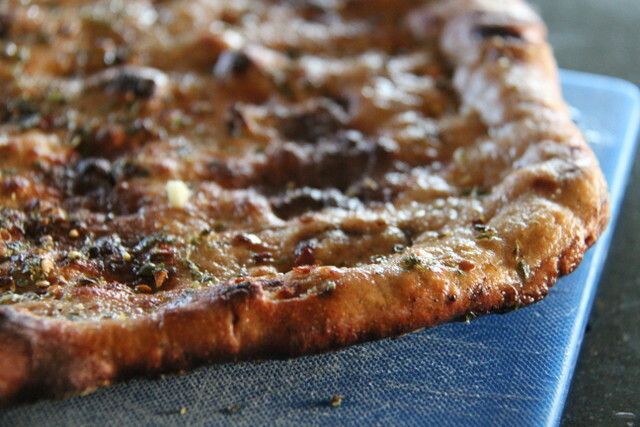 The emmer flatbread yielded enormous nutty, rich flavor with small, delicate bubbles ( the class favorite). 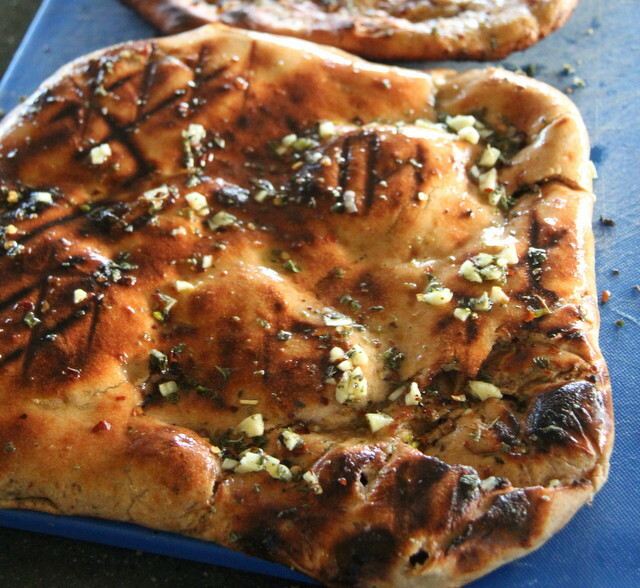 The 100% einka flatbread yielded a soft textured, slightly airy bread with mild, vanilla flavor. The 50/50 blend had loft with large air bubbles, a mild nutty flavor and soft pliability. Oil a large ceramic bowl with 1 teaspoon of olive oil. Combine 1 1/2 cups of warm water, yeast and honey in the bowl. Allow the yeast to bloom for 5 minutes until bubbles appear. Add flour and salt to the wet mixture and stir until ingredients are combined. Turn dough over onto floured surface and knead for 5 minutes, adding flour if dough is too sticky. Do not overwork dough and be careful to not add more than 1/2 cup of flour, as you want the dough to remain soft and pliable. Form the dough into a ball and place in the oiled ceramic bowl, cover and allow to double in size for about 2 hours. Punch dough down and fold the dough over itself and form the dough back into a ball, careful to not over work the dough. Let the dough rise again for about 1 hour. 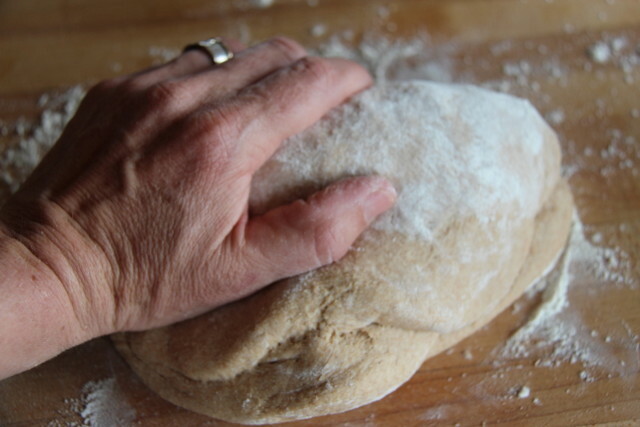 After the second rise, scrape the dough onto a floured surface and divide into 6 to 8 equal parts. Heat a large cast iron pan or grill over medium heat. Working with one piece of dough at a time, gently roll dough into small, irregular circles. Careful not to press down too hard or overwork dough, as dough will lose its loft. Move dough onto wax paper or silicone baking sheet until all the dough is rolled out. Wax paper can be used to separate each piece of dough if necessary. 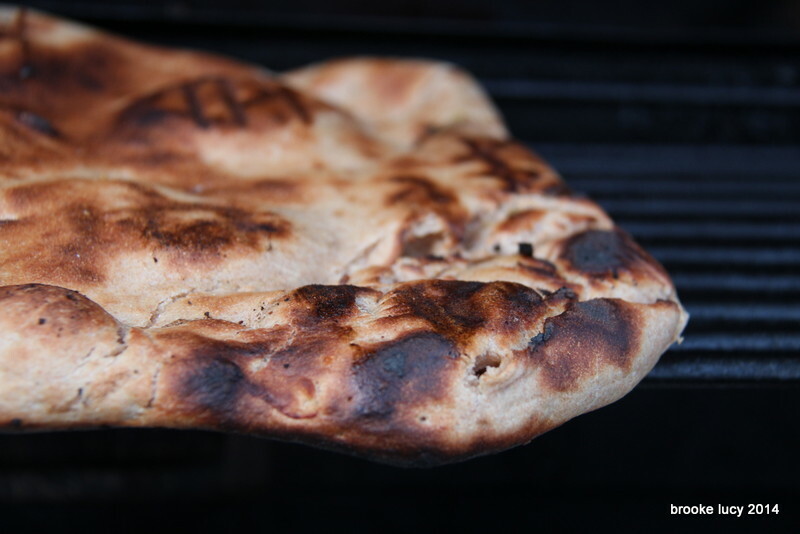 When pan or grill is evenly heated carefully select rolled out dough and brush with oil, place oil-side down. Once dough is in the pan, brush more oil, face side up. Quickly flip dough once bubbles have fully formed (about 3-4 minutes) and brush with more olive oil if needed. If dough is burning, turn heat down slightly. Allow bread to fully cook through, about 3-4 more minutes (6-8 minutes total cook time ). Move baked bread to rack and dust with dried herbs, sea salt and diced garlic. Quickly and swiftly continue grilling the remaining pieces. Most likely you will have drawn attention and will have a large crowd of eaters surrounding you, anxiously awaiting their first bite. *You can substitute Einka Flour or Hard White Flour in place of Emmer Flour. Each flour yields its own unique properties. Note: Try this recipe in a cast iron pan or outdoor grill.